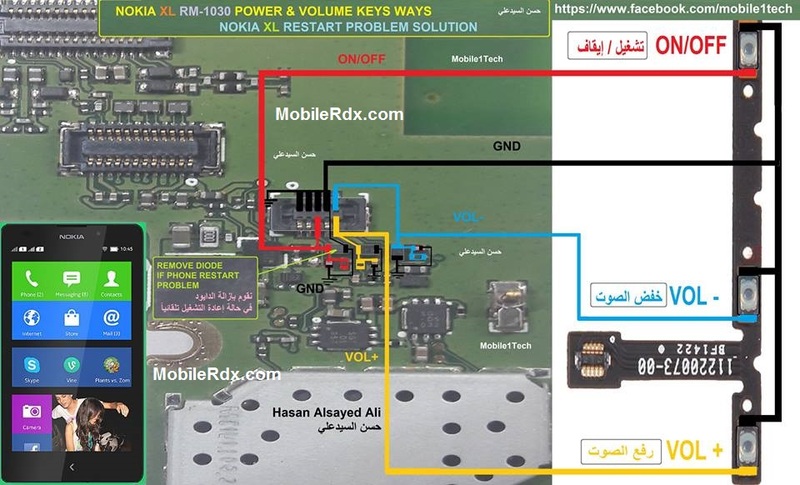 Here’s the solution for Nokia XL volume up and down control buttons that doesn’t work. This solution may only work and can be applied if the switches assembly is okay and or already been replaced but still it doesn’t respond when being pressed. The solution below shows the line paths of these said switches to the two EMI filter Ic’s which can be used to trace its lines paths or to determine which filter IC has to be checked or then replaced if found damaged. Check volume keys up down of Nokia XL, is it working, not working, or missing some keys.Make a keys button test if possible. see motherboard if there are some carbon broken parts and water damages in it. Make it clean and apply hot air with a heat gun to make it dry.